(CNN) -- A monster truck show promoter, who days earlier touted his event's safety record, died after being crushed by one of the trucks during a show in Madison, Wisconsin, Saturday night. A promoter's death was the second fatality at a monster truck event in just over a week. 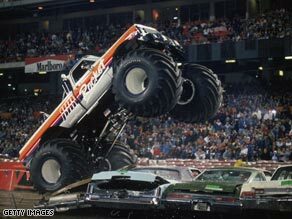 George Eisenhart's death was the second fatality at a monster truck event in just over a week. "Saturday's incident, which is an uncommon occurrence, ... was a freak accident," Dane County Sheriff Dave Mahoney said Sunday. Eisenhart, 41, died eight days after a 6-year-old boy was killed by flying debris at a monster truck show in Tacoma, Washington. The shows were staged by different promoters. Ironically, Eisenhart talked about the safety of his shows, put on by Monster Truck Nationals, in an interview with a Madison television station before the weekend event. -- CNN Radio's Patty Lane contributed to this story.